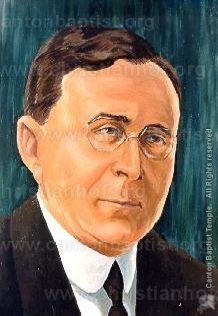 Presbyterian evangelist, J. Wilbur Chapman was born in Indiana and educated at Oberlin College and Lane Seminary. He received the LL.D. degree from Heidelberg University. He held pastorates in Ohio, Indiana, New York, and Pennsylvania. He conducted evangelistic campaigns in Canada, Hawaii, the Fiji Islands, Australia, New Zealand, England, Scotland, Japan, Tasmania, and the Philippine Islands. Chapman became the director of the Winona Lake Bible Conference and helped set up conferences at Stony Brook, Long Island, and Montreat, North Carolina. He was made executive secretary of the Presbyterian General Assembly in 1903. He won thousands of souls to Jesus Christ and influenced hundreds of young men to enter the ministry. He was cultured, earnest, enthusiastic and “sane.” In his preaching and manner of life he was never coarse or thoughtless. His preaching was calm, but forceful, emotional, but not dramatic.